SUNRISE, Fla. — Just putting the puck on net paid off for Ottawa Senators defenseman Joe Corvo on Tuesday. Corvo picked up a goal and an assist on seemingly harmless wrist shots from the point to help lead the Senators to a 4-2 victory against the Florida Panthers at BB&T Center. Colin Greening broke a 2-2 tie with 42.6 seconds left in the second period when Corvo’s wrist shot on the power play bounced off his left knee in front of the net, went high in the air and past goalie Tim Thomas. Greening’s goal, only his second in 28 games this season, was upheld after video review. “It’s interesting how goals come,” Greening said. “They come in all shapes and forms. Tonight was an odd one, but I’ll take it. Erik Condra and Bobby Ryan had the other Ottawa goals, and Clarke MacArthur picked up two assists for the Senators, who rallied from an early 2-0 deficit to win for only the third time in their past nine games (3-6-0). 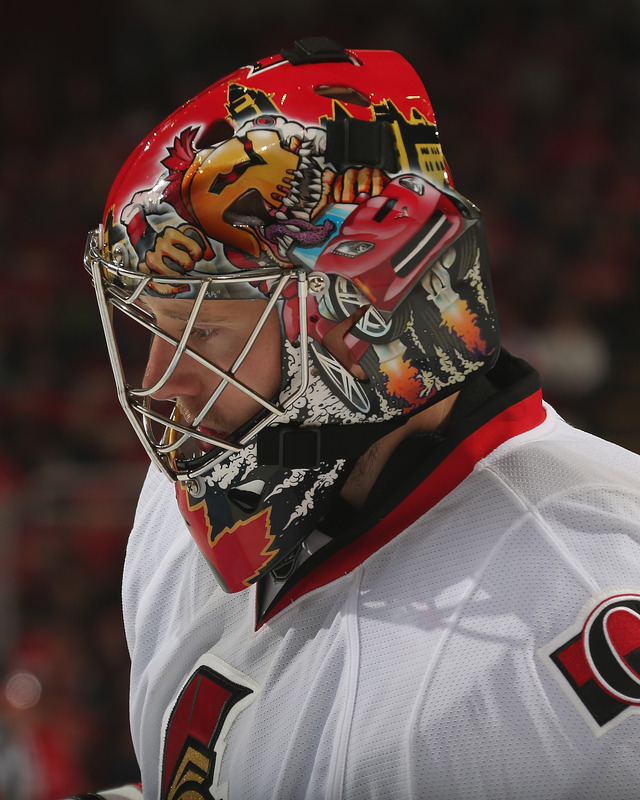 Ottawa goalie Craig Anderson, who had allowed four goals in each of his past four starts, finished with 30 saves. He improved his career record against his former team to 10-1-1. Anderson was a backup for the Panthers from 2006-07 through 2008-09. Jonathan Huberdeau and Brian Campbell scored power-play goals for the Panthers, who have lost five of six and three in a row. Campbell also had an assist. Florida is 1-3-0 on a five-game homestand that wraps up Thursday against the Winnipeg Jets. Thomas, making his 12th consecutive start, finished with 41 saves. In their first year as Atlantic Division foes, Ottawa has won the first two games against Florida. The Senators won 3-2 on Nov. 9 in Peter Horachek’s first game as Panthers head coach after he took over for Kevin Dineen. Ottawa has won 13 of the past 15 meetings between the teams. Ryan scored the only goal of the third period when he redirected Jared Cowen‘s centering pass after a turnover at the Florida blue line. The Panthers, who came in with the NHL’s 29th-ranked power play, took advantage of a 5-on-3 opportunity to take a 2-0 lead in the first period. The Panthers would get another power-play opportunity in the third period, but not before Ottawa had seven of them. The Senators went 1-for-7 with the man advantage; Florida was 2-for-3. Huberdeau opened the scoring at 6:44 of the first when he blasted a rebound of Tomas Fleischmann’s one-timer through Anderson’s legs. The assist was the first point in 10 games for Fleischmann, Florida’s leading scorer each of the past two seasons. Campbell scored at 8:22 with one second left in the second Ottawa penalty, a goaltender interference call on Jason Spezza. Campbell took a diagonal pass from Upshall at the top of the left circle, skated in, and beat Anderson with a pinpoint wrist shot high to the glove side. Those were the fastest two goals for the Panthers this season and only the third time they scored twice in the first period. “We came out, get the 2-0 lead, and it’s our job to keep it and not let the momentum switch no matter what happens,” Thomas said. The Senators tied the game before the end of the period, during which they outshot Florida 21-10. After Anderson made stellar pad saves against Upshall and Nick Bjugstad, Ottawa outshot Florida 12-0 over the final 7:40 of the period. The Senators ended up outshooting Florida 45-32. The 45 shots was Ottawa’s highest total since they put up 46 shots in a 1-0 victory against the Buffalo Sabres in their season opener. Corvo cut the Florida lead in half when his wrist shot from the point found its way past three or four players and beat Thomas high to the stick side. Condra tied the game with 1:15 left in the period after getting knocked to the ice by defenseman Tom Gilbert, getting up and one-timing a pass from Spezza from behind the net past Thomas. Defenseman Marc Methot returned to the Ottawa lineup after missing the Senators’ 4-2 loss against the Detroit Red Wings on Sunday because of the flu. Senators defenseman Chris Phillips played in his 1,100th NHL game.